Read this article in order to learn the basics of setting up a RESTful API for your mobile app. In this section, we will guide you through server hosting, designing backend architecture, security, selecting database and storage option, and creating compatibility with the multiple platforms. Let’s dive deep towards addressing each of these points for better understanding. Data security has become the utmost priority in today’s time, where it is easy to breach into users personal data through hacking. There is a wide spectrum of the authentification approaches according to your requirement. The basic authentication technique that is using HTTP is not sufficient to secure your data. However, it is easy to implement. In order to provide a highly secured environment that offers an end-to-end approach to providing a solution for enterprise as well as mobile devices, the center point of concern when we are dealing with data security is to protect a person’s identity. Thus, we use some kind of digital encoding to protect the data or we use OAuth 2.0. It is recommended to use OAuth 2.0, as it provides double-authentification. However, OAuth 2.0 cannot single-handedly protect all data. Depending on the type of data you are trying to protect, we have the Neo-Security Stack prepared for that purpose. The given, below, is the stack that describes the standard approach (ALFA), which is used to authenticate the data. With the help of these standards, we can create the secured APIs. It is recommended to use the existing authentification techniques rather than developing in-house, as it will waste time and resources. Server hosting plays an important role, as based on the project requirement i.e. project scalability, performance, and administrative features, a server type is decided. Many mobile app development companies prefer to avail the cloud-hosted solutions, which are easily available, rather than hosting their own server. There are many factors that play an important role in deciding where to host the server. Some are costing per increment to the usage requirement, migration feature allowing you to have multiple environment presences, the security of your data and system, etc. Architecture is developed in three phases starting from the development, staging, and production. Development: In this stage, developers perform meticulous coding and testing in order to develop a user-friendly app. You can take this stage as the layout or backbone of the application. Data used for testing the app is generated by the developers with the help of the pre-generated scripts. The database is filled with the sufficient amount of data in order to run the test. If your code gets a successful approval from the QA, then it enters the next phase, i.e. Staging. Staging: Here, the data is real-time data, which means now you will import the data from the real-time. The better the quality of the data, the more reliable your code is. Thus, try to use the real data to run in this phase. Production: This phase needs to be free from bugs, loopholes, and any kind of time delay in the system. If the system is not able to reproduce the same quantity of data then, it means you have to move down to the phase 1 to make changes in the code and fix the issues. When we are considering developing the API, it means we are developing it not for just one single platform, but for a wide range. API should be scalable enough to accommodate the future changes too. Also, while making an API, preassume your users as naive as possible. Thus, storing all the heavy sorting, data aggregating, and consolidation on the server. This will make the logic for the client simpler. Creating API for the multiple platforms will help you as a developer to write the code once for all types of platforms including iOS, Android, and Web. For the future perspective, debugging and reading logs becomes easier with this approach. The type of database you are using depends on the data. It might be possible that you implement the traditional version of the database like MySQL or you would prefer a more scalable version of the database like MongoDB. Every database has its own advantages and is suitable to implement based on the data you are working on. Less data mismatch because of well-structured data and rigid data. Domain-specific knowledge is required for scaling. So, after learning about the basics of APIs, tools, and types of APIs, it is time to start coding with your first basic RESTful API for your mobile app. Step 1: Create a file name “index.js”. Step 2: To import the Express module, initialize the Express object, a manager for GET/notes which reverts back to the request with a JSON object. Also, initialize the port number where the express links to the HTTP. Say, for example, 3000. Well, you have created your first basic REST API. You can see the result of your request on http://localhost:”Port address”/notes. Now you can check the API authentication and testing with the help of the tools. For a better understanding of how to code, please refer the below images. Here, we request the API to give us the details of the occasions (Birthday, Festivals, Events, etc). 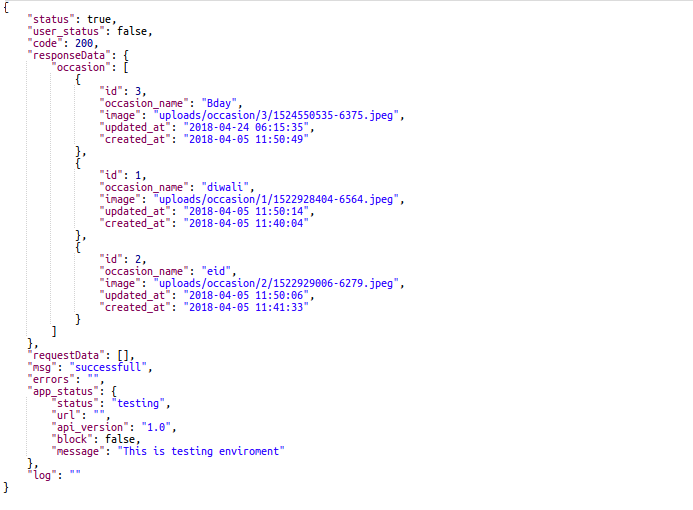 API gives the response back by giving the details in the various formats like JSON, HTML, TEXT, XML, etc. Above, we have tried to give you an insight to the API know-how. It is recommended that to become a top app developer, you should start with developing an easy API first, as this will help you understand the basics. Also, when you are working on a backend project, try to communicate with the development team as much as possible. This will reduce the bugs at the endpoint and will surely eliminate any lagging in the implementation of the API. Published at DZone with permission of Hemendra Singh . See the original article here.